Francis Scott Key’s Birthday–Born in 1779. Columbus Set Sail on His 1st Voyage In 1492. Alfred Lord Tennyson’s Birthday Born in 1809. Odie’s Birthday Garfield the Cat’s friend. More Herbs Less Salt day–Eat Healthy Day! If you are looking for fun august activities, look no further. 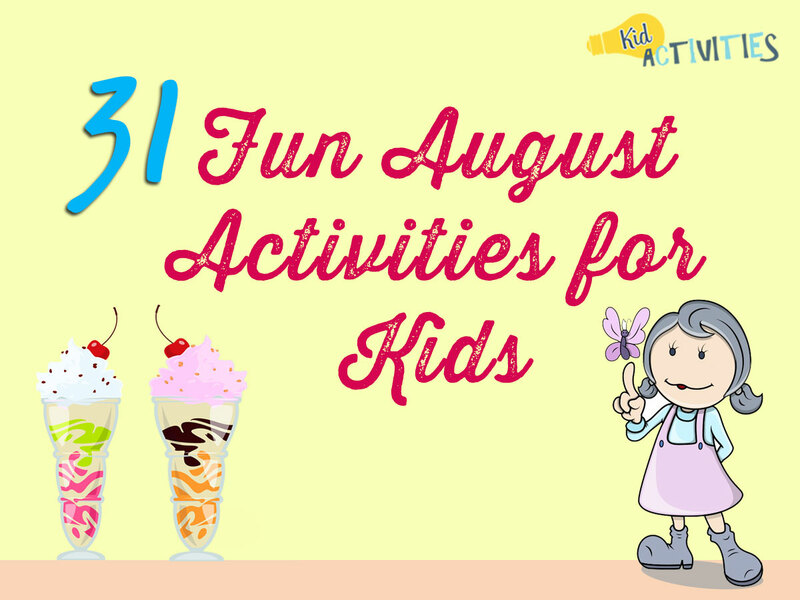 Here you will find august themed game and activity ideas to keep kids learning and having fun. Take a store bought pound cake and slice it long wise into three slabs. Cover the first slab with sliced strawberries (drain first). Add the second slab and cover with blueberries (drained). Top with the remaining slab and frost with either cream cheese frosting or whipped topping. If using cream cheese frosting, refrigerate. If using whipped topping, freeze. Serve immediately (allow the frozen version to thaw). 13. MAKE A CHERRY-BERRY ‘DUMP CAKE’! 2. After the children have observed the blueberries add a little water to them and cook them in the microwave for one minute. 3. Have children mush them up. Use the blueberry juice to paint a beautiful blue blueberry picture. If you are back to school or work in a child care program celebrate this month–challenge the children to come up with unique and useful inventions! 1. Open up your recycled supply area and provide materials such as- pieces of wood, used CD’s, milk containers, straws, tape, pipe cleaners, paper clips, yarn, string, paper, glue, poster paint, markers, crayons, elastic, fabric scraps, construction paper, pom-poms, rubber bands and safety pins. 2. Children can work individually or in small groups; Give them plenty of time to brainstorm ideas. Challenge children to come up with unique, creative, and useful items. 3. The kids may need more than one day to complete their projects; however, when complete- share the inventions with the group. What materials are used to make it? 5. SHARE IT…This is an activity that takes time and thought. Honor the children’s work by inviting parents and visitors to view the display. A written description of each “invention” would also be a good idea. Put identical items in paper bags. Challenge the children to see what unique creations they can come up with. Items to include could be things such as: pipe cleaners, old cds, string, tape, paper clips, rubber band, etc. Children can work on there ‘creation’ individually or in pairs. There are several versions for playing this game. This one is the most basic. 2. Two players are ‘fielders’. They each stand at a base and toss the ball to each other. All other players are ‘runners’. If there is more than one runner–they divide and go to the bases. 3. The object is for the runner(s) to move from base to base without being tagged as the fielders toss the ball back and forth. If a runner is touching a base, he or she is safe. If they make it to the next base without being tagged out they score a run. If they are tagged it’s an out. 4. A runner cannot hug a base. He/she must run at least every second time the ball is thrown. The fielder does not have to stay on the base to catch the ball. They may go after each runner. 5. The goal of the game is to touch the bases as many times as you can without being tagged out. The runner must keep track of how many times they touch the base before a fielder tags them out. When that runner gets out, they rotate positions so that the fielders can be the runner. After everyone has ran, they compare scores. (bases touched). Kids love to have their faces painted! Keep the designs simple and provide a limited number of choices so you can move lots of kids through. You can make your own face paint (At page bottom of Paint Recipes) or purchase it from a party supplier or costume shop. For each team have a box containing a complete costume, each costume should have the same number of pieces (4 or 5 is fun – Shirt pants, big shoes, huge tie, clown nose, wig or mask, etc.) Anything silly that a clown might wear! In turn –each player must put on the costume and run to a certain point where they take the costumes off and put them back in the box. Want more relay race ideas? 1. This is a great activity for kids of all ages! Purchase or make bean bags suitable for tossing and draw a large picture of a clown on a piece of cardboard with its mouth wide open. 2. Draw and cut out the mouth so you have a hole large enough to toss the bean bags through. 3. Place the box about ten feet away (adjust distance for the age of your children) and give each child a chance to toss the bean bags into the clowns mouth! Materials: Large sheets of paper (roll paper), markers, crayons, decorations as desired. 27. Make a SMILEY FACE TREAT! As a base use large round cookies, unfrosted cupcakes, bagels, bread cut into round shapes, or rice cakes. Spread the base with a variety of ingredients such as peanut butter, cream-cheese, frosting, or Nutella. Add facial features using M&M’s, spice drops, raisins, banana slices and/or veggie pieces! One at a time measure people’s smiles with a ruler (or measuring tape). This is fun. You can also measure the zany faces! You can take photos as you do this as people are smiling BIG! In this game, players are forbidden to smile, but –giggling and laughing will abound anyway. 1. Players sit in a circle, making sure they can see everyone else. One player who is “It” starts the game by smiling widely, while all the other players are somber. “It” then uses their hand to wipe the smile off their face and throw it to another player— who has to catch the smile with their hand — and then put it on. 2. The new “It” can wipe off the smile to throw to someone else–(though he/she will probably choose to make funny smile faces at everyone for a minute or two before relinquishing the happy role.) Meanwhile, all other players must sit stone-faced. One smirk and they’re out. 31. HAVE A PAPER-AIRPLANE DAY! Create and decorate paper-airplanes. Come up with categories for the fun. Who’s can go the farthest? Straightest? Highest? Can anyone fly it through a hula hoop? Do loops? Make a ‘bull’s-eye’ similar to what you would use for playing darts; can anyone hit the bulls eye…or the outer circles? Plant produce –Donate the harvest to a local food bank. Plant seeds. Sell the flowers or plants and donate the proceeds to a local organization in need. Make treats for a local senior home. Develop and maintain a recycling program at school. Collect food, warm clothing, toys, or personal care items for the needy. Deliver to shelters. Remember shelters are in need of supplies all year long! Hold a Teddy Bear and Friends (Stuffed Animals) Drive. Donate the collected animals to a Homeless Shelter for new arrivals. Also…check with your local police station or fire station. Many are happy to take Teddy and Friends; a teddy bear can be a comfort to children in times of distress. Make center pieces, holiday cards, birthday cards, and notes for assisted living facilities, children hospital wards, or meals on wheels. Donate old eye glasses to an organization or place that recycles them for the needy. Collect old stuffed animals and dolls, clean them up, repair and then donate them. Collect old clothes and donate them for a dress-up area at a daycare or family shelter. Write letters to service men/women. Put together a care-package for service men/women. Establish a PEN PAL PROJECT with senior citizens in a nursing home; children in a local hospital, or children in another country. Here’s a ‘cool’ summer/warm weather service idea! Collect pennies and then provide popsicles for a kids’ homeless shelter. They’ll love it! One summer program collected 19,447 pennies. A lot of popsicles! 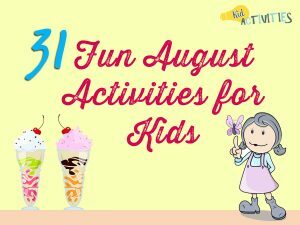 There you have it, 31 fun August activities for kids. We hope you have enjoyed the ideas and you are able to incorporate them into to your day to make it fun-filled!